Autonomous networking appears to be all the rage. A recent Google search for the term ‘network automation’ delivered 314,000,000 results. Networking vendors have spent the last year touting their automation visions, and service providers have spent their time creating and delivering automated processes. Everyone seems to be all in. But, I would like to ask – in our haste to replace, are we creating “automation islands”? Let’s start with a simple question - what is an “autonomous network”? A simple definition is: an autonomous network runs with minimal to no human intervention—able to configure, monitor, and maintain itself independently. Basically, it is a self-managing network that can use telemetry, analytics, artificial intelligence and machine learning to respond to and adapt to customer requests and an ever-changing environment. Why is the concept of an autonomous network so important? Most of today’s network infrastructures are burdened with decades of older equipment, older protocols, spreadsheet controls, and massive and arcane business and operational systems. Operators and their customers are looking for a change. Operators need to reduce time-to-market and provide a highly efficient business model. End users want dynamic bandwidth and dynamic service pricing and they want it delivered now. With all of these pressures, operators are turning to automation to redesign and speed up certain repetitive processes such as configuring new wave services or new Ethernet services; offering customer portals that permit the end user to control bandwidth demands; or even creating ways to update network elements without human intervention. Automation needs to be thought of in a holistic manner, not in a one-off, reactive conglomeration of different processes. If not done correctly, there is a high probability the operator will end up with “automation islands” – standalone automated processes that cannot be linked together and may even compete for the same resources. If automation is performed correctly, it can be a very good thing. Reducing the potential for human error, speeding up responses to service requests and providing self-help tools to customers means the operator can deliver on-time, and when and where needed. With the proliferation of devices and demand on the network (think Internet of Things (IoT) and 5G), networks must adapt and become faster and more intelligent. But automation needs to be thought of in a holistic manner, not in a one-off, reactive conglomeration of different processes. If disparate teams within an operator begin building autonomous processes without a plan, without coordination and without an end game, then when the time comes to merge these processes into an eco-system failure is a certainty. The market is rife with differing vendor implementations, differing hardware options, differing software capabilities and a myriad of orchestration systems. Putting an overall plan in place that is provides automation processes with a common framework and with openness, scalability and security must be the first step to a new network. 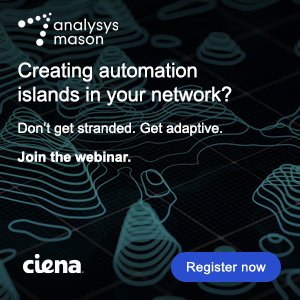 If not done correctly, there is a high probability the operator will end up with “automation islands” – standalone automated processes that cannot be linked together and may even compete for the same resources. Before beginning the automation journey, the operator needs to design and build an adaptive eco-system so that the various groups who are automating processes can use tools and resources that mesh with the tools and resources being used by other groups. Choosing a closed architecture that relies on one network vendor is probably not the most productive path - the automation process must be able to take advantage of a variety of hardware and software implementations (even those not built yet) to ensure the best possible outcomes and avoid the dreaded automation islands. At Ciena, we have thought long and hard about how to help our customers achieve such an architecture. We call this vision the Adaptive Network. 1. Programmable Infrastructure: A programmable packet and optical infrastructure is one that can be accessed and configured via common open interfaces, is highly instrumented, with the ability to export real-time network performance data, and can adjust its resources as needed to meet the demands of the applications running on top of it. 2. Analytics and Intelligence: Collecting network performance data, and analyzing this data using machine learning and artificial intelligence (AI), provides the ability to more accurately predict potential network problems and anticipate trends by turning mountains of data into actionable insights. Leveraging these insights can help network providers develop smarter, data-driven business policies that enable them to adapt to customer needs securely, and in real time. 3. Software Control and Automation: Multi-Domain Service Orchestration (MDSO), federated inventory, and centralized, software-defined control of individual domains form the basis of adaptive networking. Through the implementation of SDN, NFV, and open APIs, network providers can simplify the end-to-end management and automation of network services across multi-vendor, hybrid networks. Understanding how these three foundational elements work together is a critical piece of the automation journey. If there is not an underlying architectural plan in place before beginning the automation journey, there is a real chance the provider will end up with disparate and isolated systems – so-called automation islands. With the Adaptive Network vision in place, the tools and resources required by various automated processes have a much better chance of interacting correctly and the provider has a much better chance of successful automation.